I'm using Drupal 7, with the latest date module release. I've added a date field to an event node type I created. However, when I go to create a new event, the example date given (the date format description) underneath the date field uses the American date format of m/d/y. I want to change it so that the example date uses the English date format of d/m/y. Can someone tell me how to do this. I did change all the date formats in the date format section to UK date formats, but this hasn't made any difference. I also changed the timezone to Europe, also with no effect. I'm sure there is something simple I'm missing? 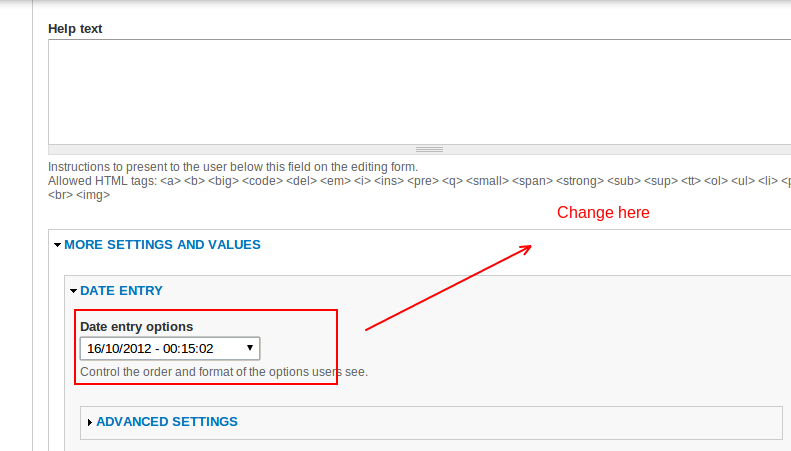 You can change the format in field settings. Follow below steps to change. Not the answer you're looking for? Browse other questions tagged 7 datetime or ask your own question. For an event node type, should I use Datetime or Datestamp? How do you apply timezone formatting to a date? How to show time in node.tpl.php that takes the configured timezone settings into account?